I planted a tree today, along with eight other people, and we didn't even have to roll up our sleeves to do it. I bet you haven't heard of Tennessee Skies airlines, have you? I hadn't either, until yesterday. Due to an unfortunate stomach bug, I was stranded in Atlanta while Adam and Lydia made their way back to Nashville. We had lots of options to get me back thanks to all of the family that were there, but all of them committed an extra day of driving to get me to Nashville. On a whim, I logged on to Travelocity just to see what a flight would cost, knowing that a last minute Delta fare would be crazy expensive. Back in the days of Site59.com, Lydia and I would occasionally find great fares, and since Travelocity ate them up a few years ago, they have had some of those deals too. Instead, I found a flight operated by Pacific Wings, another airline I'd never heard of, and it was considerably cheaper than the closest Delta choice. Wanting to find out more, I went to the Pacific Wings website and found that they only flew flights around Hawaii. So, I went to the source of all truth: the Wikipedia entry on Pacific Wings. It turns out that Pacific Wings is attempting to make a run at several Essential Air Service markets. After deregulation, some smaller airports ended up with no service because they couldn't be profitable, so the U.S. Government is now offering subsidies for carriers that provide service there. Pacific Wings operates as New Mexico Airlines with service to several New Mexico and Texas airports, as Georgia Skies with service from Atlanta to Macon and Athens, and as Kentucky Skies/Tennessee Skies with service to Atlanta, Jackson, TN, Nashville and Owensboro, KY.
Oddly, each of the websites above is very restrictive in the flights you can book. For instance, on the Georgia site, you can't book ATL-BNA, but on the Tennessee site, you can. I wonder if it has something to do with the EAS subsidies. On the upside, once you find the website you want, the fares are lower than you can find on a consolidator. All in, my same day of purchase, one way ticket was $104, and that includes two checked bags! Pacific Wings flies a fleet of Cessna 208B aircraft. Also known as the Grand Caravan, this nine-seat prop plane is what Pacific Wings calls their "EcoJet." There's nothing jet about it (that I can tell) though... unless you consider a TurboProp to have jet characteristics. However, it is, of course, greener than a jet, and that's where the tree comes in. According to their website, not only am I saving the planet by choosing a green method of travel, they actually plant one seedling tree for every passenger they fly to partially offset their carbon emissions. The process of flying wasn't that different from other airlines. I booked the ticket on their website and was given a six-letter PNR for my e-ticket. When we got to the airport, they had one check-in counter, nicely appointed with an inkjet-printer sign with all of their various brand names. I checked one bag and, believe it or not, a baby gate. The agent noted that the baby gate was oversized, but didn't charge me extra for it. One note of advice for those of you flying out of ATL... the agent recommended that I go in the South Terminal Checkpoint which is the one closest to their gate. For myriad reasons, I ended up in the North Terminal Checkpoint line which is pretty much all Delta, all the time, and when the TSA agent checked my boarding pass, she didn't recognize the airline and had to call over the supervisor! After a couple of minutes they figured out where the airline code was and let me through. Pacific Wings/Tennessee Skies/Georgia Skies/Kentucky Skies flies out of one gate in ATL: E37. It is the last gate in the last terminal in the airport. Once they call for boarding, you then ride a bus out to the plane, so leave yourself PLENTY of time! My boarding pass for the 12:25 ATL-BNA flight showed a 12:05 boarding time, but they didn't call us until 12:20. Once they call to board, the nine of you plus the pilot walk down a set of stairs and onto an airport bus for a short (it's about 100 yards) trip to the plane. At the plane, the pilot calls each passenger by their first name and tells them which seat they're sitting in. It feels a little like you're flying in someone's personal plane. The seats are leather, but not plush, and there are no tray tables. The seat belt also has a shoulder belt, which is actually nice in turbulence. There's no room under the seat to stow items, but there is ample room around the seats for purse/computer bag-type carry-ons. Once everyone's boarded, the co-pilot reads the safety instructions. Several passengers took pictures, and before we got off, the co-pilot offered to take their picture. With the size of this plane, there's no steel door between the cockpit and cabin - you're all in the cabin. Takeoff was great... I bet we were in the air in ten seconds. It just takes no runway to get off the ground. The flight was uneventful. Because it's not a pressurized aircraft, you're flying pretty low, so it's fun to see the landmarks and scenery along the way. On my side of the plane, I got a great view of Chattanooga, but I was looking the wrong way for Monteagle. There were only a couple of times where there was what I would consider "disruptive" turbulence... the majority of the trip was smooth as glass. Landing was spot-on too, and since they haven't negotiated a slot at BNA, they're using the FBO terminal, which means no TSA screening, and Lydia met me right at the tarmac. It felt a little fifties, actually. So, if you have the opportunity or need, is Tennessee Skies worth it? It's a bit of a tough call for me. First, there's the cost - at the price I paid, it was totally worth it. There was no competition. Second, there's the time. All told, it was three hours door-to-door from my departure point in northwest Atlanta to my home in Brentwood. By car, that's four hours, so it's a little hard to make the case on time alone. In this instance, it fit my need perfectly, and I had a great experience. 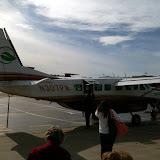 If I were at all squeamish about flying, I'd be scared out of my pants on this tiny plane. I would not recommend this ride for children under seven. Also, if the weather was at all inclement, the ride would be very rough. And, if the outdoor temperature was going to be above eighty degrees or so, I don't know that the Cessna's air handling system could hack it... it was very comfortable on the 40-degree day on which I flew... at least while I was wearing my jacket. So, for last minute, know-that-the-weather-will-be-good flying, Tennessee Skies fills the bill. Your thoroughness never ceases to amaze me!